Autumn is a favorite season for many people. The air is cooler which is a nice change from the hot temperatures. Leaves are changing from green to a variety of bright and beautiful colors. Autumn is quickly approaching and with it comes colds and flu. With children back in school, colds and flu have an advantage over making everyone sick. Germs love warm crowded spaces and little hands that move all over the place. The following are tips to help you and your family stay healthy during this autumn season. Make it a habit in the home to wash hands thoroughly and frequently after using the bathroom, before and after eating, and after arriving home from being outside. This can prevent germs from spreading. Stick to normal soaps. Anti-bacterial soaps are known for wiping out the healthy bugs which help strengthen the immune system, keeping them healthy. This may be a little harder to ensure that everyone is drinking enough water as autumn is cooler and people may feel less thirsty. Try to remind yourself first to drink plenty and then those around you. Always serve water with meals and snacks. If you want to give your children juices stick to making your own with fresh fruits instead of giving them commercially made fruit juices that are loaded with sugars. The body's immune system quits working well when the body becomes sleep deprived. This time of year is not the time to cheat you or your family with less sleep. School aged children typically require at least 10 hours of sleep each night. Younger children need even more. Boost your family's immune system by serving up an abundance of healthy and nutritious meals and snacks. Opt for healthy carbs and foods that contain high amounts of vitamin C, good fats, and antioxidants such as baked potatoes, oranges, nuts, seeds, and fish. Homemade soups and stews are a must during the colder month as you can add in a variety of healthy and colorful vegetables. Sugar can weaken the immune system putting your family at risk for getting sick. Instead whip up some homemade biscuits, fruit and yogurt parfaits, and berry smoothies. When putting together family meals add in some extra herbs and spices. These help strengthen the immune system naturally. Great choices are black pepper, cinnamon, and garlic. Dress up appropriately and either enjoy a walk together as a family or let your children play while you do some chores around the yard. Getting in some light exercise will help with healthy digestion and help regulate blood sugar levels. Germs tend to collect in certain areas of the home including door knobs, telephones, remotes, light switches, and sinks. Be sure to have a disinfectant spray handy to go over these areas often. You can also make your own by simply mixing equal amounts of vinegar and water into an empty spray bottle. If your hands are covered in germs and you reach up to touch your face particularly the areas around the eyes, nose, and mouth you put yourself at greater risk of becoming sick. This may sound so simple but it is amazing how many times you can be out shopping and see so many people just cough or sneeze so openly. Instead of spraying your germs on everyone around you cough or sneeze into your bent elbow to keep the germs contained. By doing this method you will also save your hands from getting sprayed. Remind yourself and your family often to practice this. 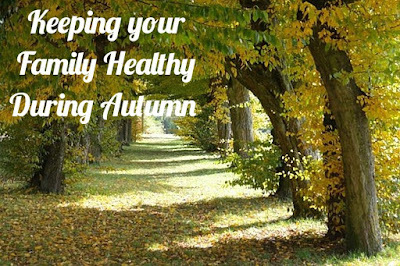 What do you and your family do to keep healthy during autumn? Eating healthy is a big advantage to staying well. We always makes sure to wipe down grocery carts too. I hate to see parents drink and eat after their children then complain they are always sick. Kids are full of germs! Hahaa. Hope everyone stays well.